My introduction to gardening began with time spent in my grandfather’s garden. His suburban lot was no bigger than 10,000 square feet, but it was a sanctuary from the dysfunction of my immediate family. 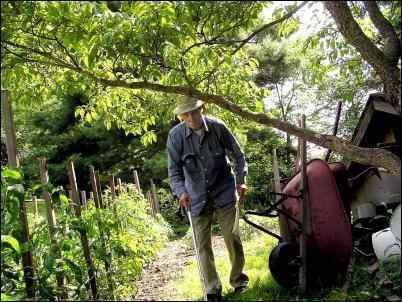 I spent weekends there, and my grandfather prided himself on his tomatoes—his favorite plant to grow. His wish was that, someday, I would buy a nursery and place him in charge of tomatoes. 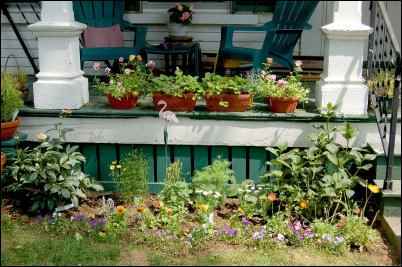 He also grew ornamentals, but not a wide variety, and he thought that wild violets were the best flowers growing. Some people in this area treat them as weeds, but he loved them. As I grew older, got married, and had children, I started my own garden. At the time. I lived on a small, pie-piece-shaped suburban lot which acted as a fork between two roads. I converted the yard into a garden—no lawn, just a meandering path with some arbors and beds defined by railroad ties. The result was amazing; I grew everything from vegetables and roses to herbs and perennials. By that time, my grandfather was slowing down and was diagnosed with Emphysema. He was easily winded and could no longer work in the garden. My sisters and I would take turns mowing his lawn, but he had given up on his tomatoes. I wish now that I had known about the concept of Horticultural (or Garden) Therapy back then. I realize now that by mowing the lawn for him, we probably made him feel worse. It was likely a reminder of what he could no longer do. By employing some adaptive devices, I may have been able to prolong his gardening activities and thus help him to maintain some dignity, pride, and independence. One Father’s Day, my gift to him was the creation of an L-shaped perennial garden where his vegetable garden once was. I dug it out, amended the soil, brought him some divisions from my garden and added some nursery-bought plants. The new garden included hostas, roses, irises, daffodils, lilies, mums, and—of course—wild violets. 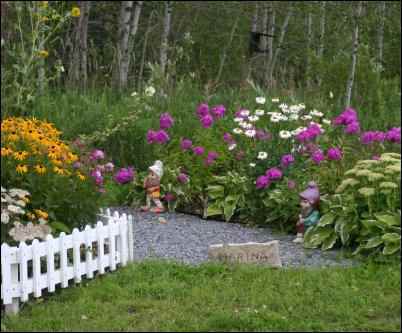 He visited the garden every day to see what was blooming, to water, and to sit a while. That garden drew him outside each day for a few more years until he could no longer leave the house…the following winter, he passed away. The next few chapters of my life found me moving twice and facing many challenges. New gardens sprouted with every move and I continued to grow alongside my plants. I have always found great solace in the garden; it is where I’ve lost time and connected to Self. It has been my restoration, my solace, and my active meditation. It has been my compass and my rock. My present life finds me weaving the roots of gardening into my vocation. 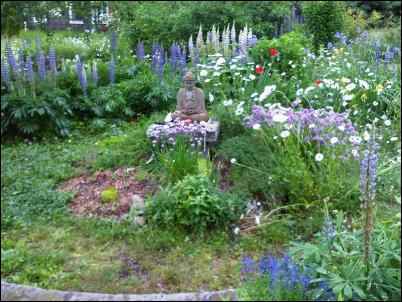 My healing practice combines holistic life coaching, Reiki, and the principles of Horticultural Therapy into “Garden Therapy”: a unique healing treatment for clients experiencing some sort of life transition. Our ancient ancestors knew that the body, mind, and spirit were interconnected. They relied on nature, especially herbs and other plants, as well as prayer and connecting to intention, the power of the mind, to heal the sick. As we approached the advent of modern Western medicine, doctors began to dissect the body—literally and figuratively. No longer was the focus on the body, mind, spirit connection. Instead, doctors specialized. One doctor focused on psychiatry, another on the immune system, another on dentistry, another still on neurology, and on, and on, until no one was looking at the whole person anymore. And the soul? That was relegated to the concern of religious leaders. In recent history, the tide began to turn, ever so slightly. Chiropractic medicine and acupuncture, once considered patronized only by society’s outer fringes, eventually mainstreamed into allopathic medicine. This trend continues today with the practice of Reiki, therapeutic massage, and reflexology becoming more widely accepted and used in what’s been termed “integrative medicine” models. I’ve personally seen Reiki being used in hospice situations and in hospitals. In fact, many students in today’s Reiki classes are nurses. Another therapy that has emerged is Horticultural Therapy: the use of plants and gardening activities to help individuals reach certain therapeutic goals. It has enjoyed widespread use and attention in clinical settings such as nursing homes, hospitals, and rehabilitative centers as well as prisons, youth centers, and group homes for the mentally and emotionally challenged. Its applications are far-reaching, from physical and vocational rehabilitation to socialization, cognition improvement, and mood stabilization. The path I chose to follow (well, really, it chose me), led me to develop “Garden Therapy” which is based on the principals of Horticultural Therapy, but transplants (pun intended) those principals from a clinical setting to a more accessible setting (like your backyard) for everyone’s benefit. The ancients knew this secret. They knew about the everyday benefits of using herbs in cooking and healing. They knew just being in and around gardens can literally lower blood pressure, alleviate depression, and decrease physical pain. They knew it was the perfect place to connect with spirit. If you’ve ever plucked basil from its stem and held it to your nose or rubbed a tomato vine and then inhaled its earthy aroma on your hands, you know the secret I’m referring to. It’s the secret of enjoying Heaven on Earth. It means celebrating the miracles of everyday life and of finding the Divine in the smallest seed or grain of sand. More importantly, it is the act of recognizing your Self in that aspect of the Divine—in that smallest seed and in that grain of sand. It is the ability to see the tree inside the acorn—the potential held inside of you. The cornerstone of Garden Therapy is intention. Anyone who has ever taken one of my classes knows this by heart because I drill it into them. Intention, intention, intention! What do you hope to get out of your garden space? Do you want to make it a Sacred Garden? A Healing Garden? A Memorial Garden? What sets those different types of gardens apart? Sure, you may choose specific plants because you’re interested in traditional plant meanings and their symbolism, et cetera, but mostly it will be the intention you bring to your garden, and thus, the intention you bring to your own journey. Some of you may be thinking, “But I have whatever the complete opposite of a Green Thumb is… I can’t keep anything alive!” It’s okay, you can still benefit from Garden Therapy. It’s not just about gardening, per se. It’s also about making yourself whole, through various means. Garden Therapy is a tool that’s used to help clients express their current condition and their ideal condition. It helps them to recognize their potential and how to cultivate it. It helps them to pave a path from one place to the other. 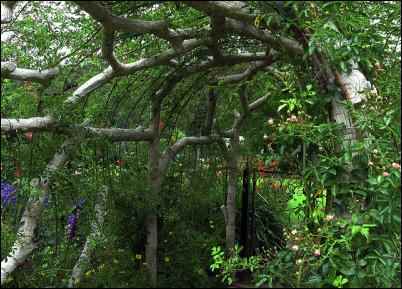 The garden serves as a metaphor for our emotional health and garden therapy recognizes this fact. For instance, a person can be “root bound”. This means they are so stuck in their ways, that those habits and beliefs are strangling the life out of them. Until some of those “roots”, or outdated beliefs are “pruned”, that person will wither on the vine, never recognizing their true potential. Garden Therapy not only explores human conditions and it’s nature-based remedies, it also explores the natural rhythm of the garden and how it affects humans. For instance, it is March and, in New England, this means the garden is covered in a blanket of snow. The plants are dormant, but there is an energy that’s barely perceptible to all but the most sensitive; it’s the promise of Spring. This is the time of year when humans are experiencing a bit of cabin fever, especially in the colder regions. They’ve been stuck inside for months and they are thinking, “Enough is enough with the cold!” So we look to the garden for a hint as to what we should do. The garden is working behind the scenes, getting ready, gathering her energy to produce new growth. So we must do the same, by starting seedlings indoors, making plans, and finishing up indoor projects so that we can focus our energy outdoors as soon as the weather breaks. Most people can identify with the use of garden metaphors when discussing their problems. By having clients think in these terms, it forces them to really get in touch with and recognize their issues, emotions, hopes, fears, and values. It’s a wonderful learning tool that I invite everyone to employ. Your roots are the equivalent of combined experiences, belief systems, familial influences, and your value system. Take a few moments to examine the health of your roots. List all of your values, qualifying each one with a short sentence or two about what that value means (i.e., if we both had “freedom” as a value, it would mean different things to both of us, so what does it mean to you?). Be specific. 1. Freedom: to be able to work for myself and live my life according to my own terms. 2. Trust: to be surrounded by people I can rely on and to live by the code of being trustworthy myself. 3. Laughter: to always have a sense of humor and see the bright side of things. 4. Nature: to surround myself with the outdoors, with plants and natural things. 5. Spirituality: to connect with the Divine in my daily activities. 6. Creativity: to approach life with a sense of creativity and originality, surround myself with beauty. 7. Self-expression: to always be true to myself and my own style and take opportunities to express myself in various ways. Next, rank them in order of importance, with #1 being the most important. Then look at how you are living each value in reality and rank it accordingly. If you say freedom is #1 for you, yet in reality you are stifled, stuck in a job or relationship you hate, doing the same thing every day, then you are not being true to that value’s importance—you are not living with integrity. Once that’s complete, you have a pretty good picture of your values and where you are falling short with being in step with those values. In the example above, “Trust” was ranked second in importance for this person, but she is experiencing it in her everyday life in 7th place. Something isn’t right. She needs to explore why this is. Is she surrounding herself with untrustworthy people? Is she being untrustworthy herself? Many times this simple exercise will expose areas of incongruence that will explain why you may be unhappy or unfulfilled. Next look at your belief system and life experiences. Are there any self-limiting beliefs or past experiences that maybe at one time served you in some way, but no longer do? Get rid of them! This is the equivalent of weeding. 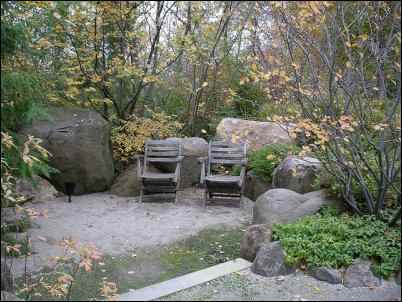 (This is where coaching and garden therapy can be used, as this can sometimes be difficult to achieve without help.) Incidentally, even negative experiences contribute something positive—it acts as fertilizer for our roots and becomes part of which we are, so acknowledge its contribution, and then send it on its way. Finally, make a list of things you are grateful for in your life. Be specific and take your time. You may want to build your list a little everyday. A daily practice of gratitude puts us in a positive frame of mind. This positive energy acts as water for our roots, helping us to grow as people and leaving us with a spirit open to accepting love and abundance in our lives.